There is a part of me that didn’t want to post this car. There is another part of me that is way too attracted to bright things. I love seeing these colors on the GT3 RS too much simply to pass them by. And this one, dressed in PTS Birch Green, is about as bright and rare as they come. CERTIFIED, ONE OWNER, CALIPERS PAINTED EXTERIOR COLOR, PAINT TO SAMPLE, PCCB, CLEAN CARFAX, PDK TRANSMISSION, SPORT CHRONO, NAVIGATION, LESS THAN 1K MILES. 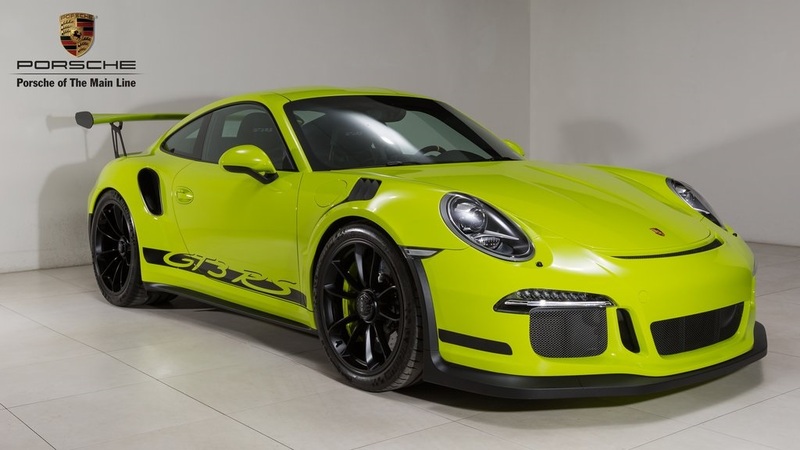 You are looking at a 2016 Porsche 911 GT3 RS. This vehicle has 389 total miles on the odometer. 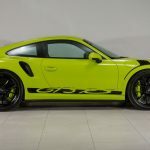 It comes fully equipped with Exterior Paint to Sample in Birch Green Non-Metallic, Brake Calipers Painted in Exterior Color, Standard Interior in Black/GT Silver, Porsche Ceramic Composite Brakes, Sound Package Plus, Fire Extinguisher, Seal Belts in Black, Porsche Dynamic Light System, Sport Chrono Package incl. Porsche Track Precision App, Vehicle Key Painted, Porsche Communication Management incl. Navigation Module, Wheels Painted in Satin Black, Instrument Dials in Guards Red, and much more! We are selling this vehicle with the balance of factory warranty which is good until 5/31/2020 or 50,000 total miles on the odometer, whichever occurs first. In addition, we are also offering this vehicle with our Porsche Certified Pre-Owned Warranty which extends your warranty until 5/31/2022. 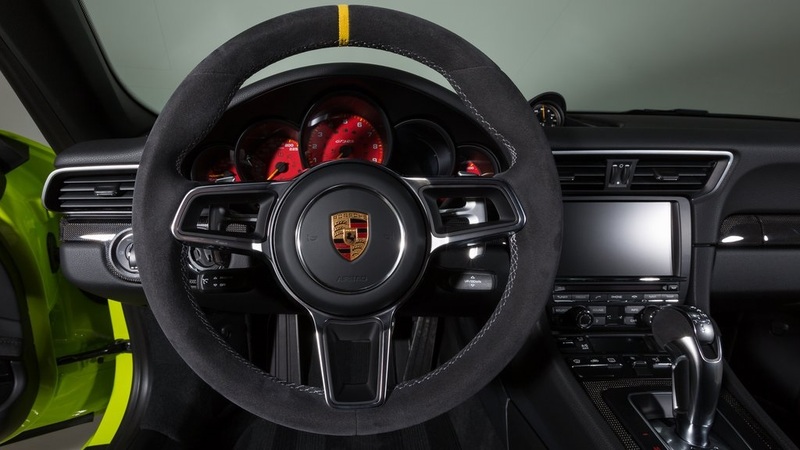 Along with the 2 years of warranty, the Porsche Certification gives you the reassurance that this vehicle is as close to new as possible having gone through Porsche’s rigorous 110+ point inspection and reconditioning process. 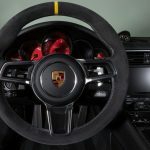 Please feel free to call or email us with any of your questions regarding the vehicle, or stop in, and find out why Porsche of the Main Line was given the award as the top Premier dealer in the U.S. An award given to the dealer who exhibits uncompromising excellence in every phase of business. A title distinguishing us as the best of the best. Please feel free to call or e-mail with any questions or comments. The question is should you buy it? I don’t mean this regarding the color and whether it’s worthwhile or anything of that sort. It absolutely is. 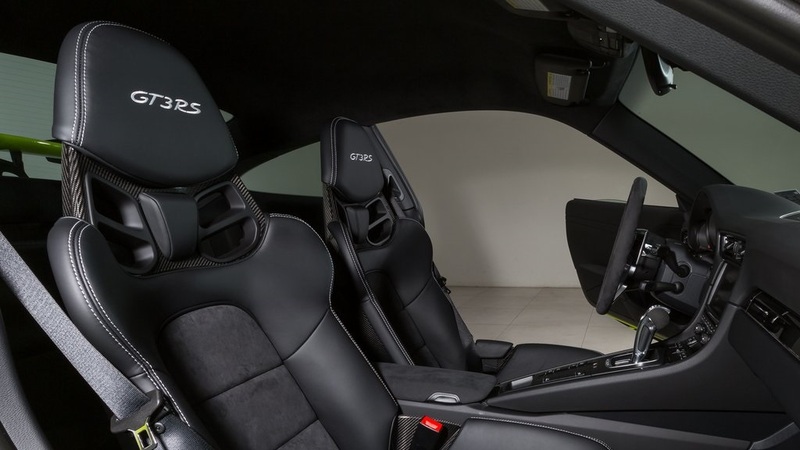 But the 991.2 GT3 RS is on its way; deliveries have begun. And I think that is part of the reason why we are seeing a car like this come up for sale. 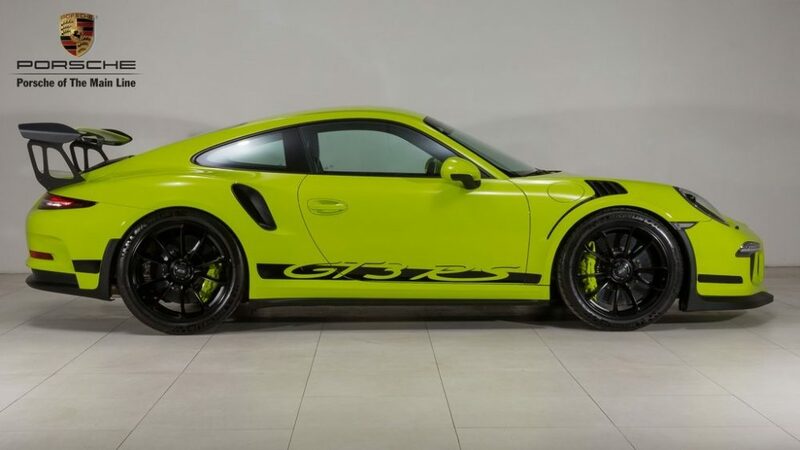 I’ve seen a lot of the .1 GT3 RS come around lately in much more interesting colors. There have been tons of regular examples available basically since production began and now the rare PTS cars are coming out of the woodwork. My sense is that owners are seeing the writing on the wall and that values are not what they may have hoped. The 991.2 will push down those values even more. It’s a better car. So the time to sell is before they too hit the market. 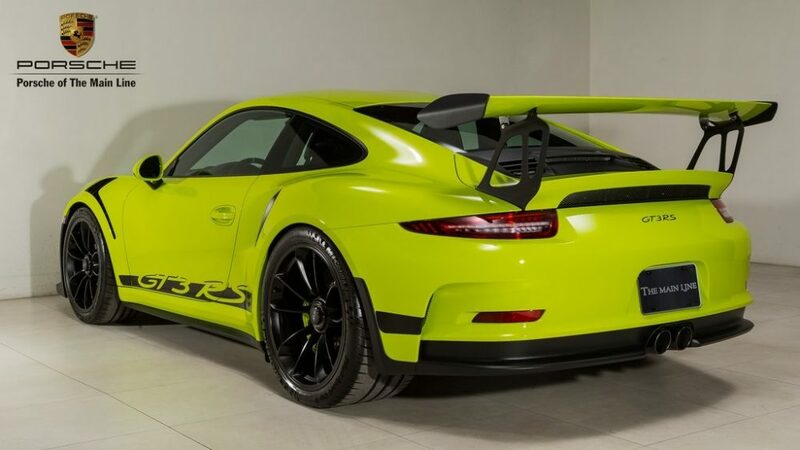 Where does that leave us with a GT3 RS like this one? The asking price is very high. I don’t know what the appropriate price should be right now, but I do not think this is it. 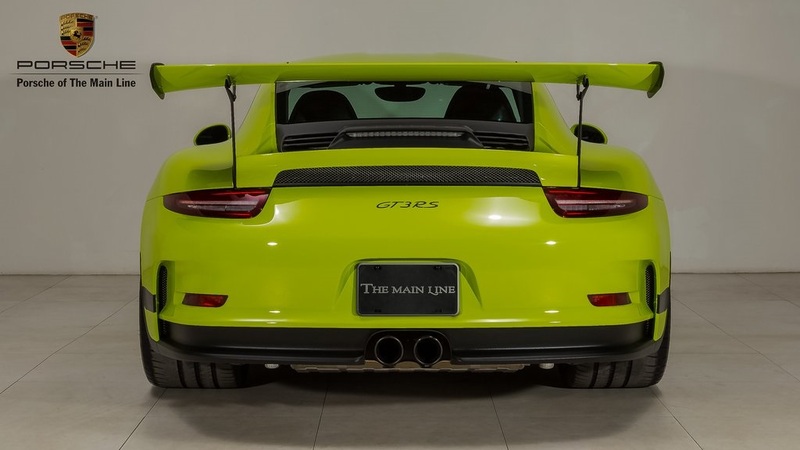 The Signal Yellow GT3 RS I posted in February was priced $30K less than this one. It did have more miles (3,055 vs 389) and that’s definitely a factor. Birch Green also is likely to be more rare, though not necessarily in the sense that it is more desirable. Regardless, that’s a big price difference. If you absolutely have to have Birch Green (I’m not sure how many others exist), then I don’t know how much you can quibble with the cost, but I don’t know that you have to jump on it immediately either. A great color on a great car. We’ll see if that’s enough for it to find a new home. Tagged 2016, 911, GT3 RS, Porsche.